This exciting synth delivers FM Synthesis, Phase Distortion Synthesis, Wave Shaping Synthesis and Subtractive Synthesis is one creative combination! Rob Papen has released version 1.9 of BLUE, a virtual synthesizer instrument for Windows and Mac. This exciting synth delivers FM Synthesis, Phase Distortion Synthesis, Wave Shaping Synthesis and Subtractive Synthesis is one creative combination! We call it “Crossfusion synthesis”. Different tuning scales – Clicking on the BLUE logo brings up the back panel, where you can load in tuning files. They added a number of world tunings: Arabic / Burmese / Chinese / Indian / Persian / Thai / Turkish / Standard European. Users can add in there own personal tuning files, either by creating their own .tun files or using other .tun files. New factory presets – Two new banks are added 19_Effect_04 and 13_Diverse Dance 01. New cool effects and some new contemporary dance sounds. New presets by Dr. Tim Waters – Some brilliant sounds are uploaded to the “user presets” section. BLUE is available to purchase for PC and Mac (VST/AU/RTAS) for 199 EUR incl. VAT / $239 USD. Synapse Audio has released a demo version of DUNE, an advanced subtractive software synthesizer instrument for Windows and Mac. Dune is a next-generation software synthesizer plugin designed for creating music on a computer. It was developed with the highest possible audio quality in mind and offers exceptional flexibility. The latter is achieved by its modulation system, the new differential unison engine (DUNE) — hence the name. Despite the complexity of the synthesizer, the highly optimized code allows Dune to run even on older computers. On current hardware, many instances can be run in parallel, making Dune the perfect everyday studio workhorse. Dune was tested by professional music producers to guarantee its ambitious design goals were met. It comes with high quality sounds, mostly created by professional sound designers. DUNE will be available to purchase for Windows and Mac (VST/AU) soon. The demo version is available to download now. Sinevibes has released version 1.2.0 of Space Oscillator, an audio-controlled synthesizer plug-in for Mac. Space Oscillator is a unique combination of a synthesizer and a sound processor. At it’s core, it has a unison oscillator with a spacious stereo sound, which is modulated by input signal envelope follower or a complex step sequencer. The oscillator is then fed into a polyphonic waveshaper, decimator and can be ring-modulated with the input signal. With such an experimental generation and effect chain, Space Oscillator allows you to create new sonic textures with a lot of original character and attitude: from organic synth and bass lines, old-school game boy sounds to rhythmic zaps and noises, extreme lo-fi glitches and much more. Vastly redesigned user interface which improves usability and now has the same style as the recently updated Gateboy plugin. Improved synchronization in GarageBand, Logic and Live. Improved synchronization during sequencer Rate changes. 30 new factory patches (for a total of 100). Space Oscillator for Mac (AU) is available for to purchase for $29 USD until the end of 2010 (regular price $39 USD). The update is free to all existing owners. 16tone has notified us that the Vogue MK2 free standalone synth for Mac has been updated to version 1.3. This includes a stereo reverb unit. Soundhack has released +phasor, a free phaser shifter effect for Mac. not a big deal – but i wrote a little phase shifter last year, and thought it would be nice to share it. it is only vst macintosh now. once i port it to au/rtas/vst mac/win i’ll probably add it to one of my freeware bundles. 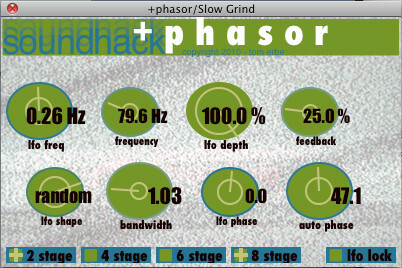 Soundhack +phasor is available as a free download for Mac (VST) here. Take Full Control of the GAIA SH-01 GAIA Synthesizer Sound Designer is a specially designed PC/Mac software application for Roland’s award-winning GAIA SH-01 synthesizer. It inspires creativity by allowing GAIA users to conveniently explore every tone parameter on their large computer monitors. 16tone have just released a new version (1.2) of the Vogue MK2 free standalone synth for Mac. With this release they have added a Stereo Delay module with Cross and Reverse functions. The increasing popularity of software synthesizers and software samplers over the past decade generated a growing interest for standardized microtuning systems based on human-readable text files containing the device microtuning data (later on referred as Tuning Interchange Documents, or TIDocs, in this document). Besides those file formats based on MIDI Tuning Standard sysex messages that can be embedded in standard binary MIDI files (.mid), some noticeable TIDoc-based solutions were also adopted to add microtonal support for commercial software synthesizers that have involved, among others, the Scala format (.scl) proposed by Manuel Op de Coul, and the AnaMark format (.tun) proposed by Mark Henning. This article focuses on the syntax requirements of the Microtuner TIDoc format (.mtx), the native file format of Max Magic Microtuner, a microtonal software developed in 2003 as a companion application for Max/MSP. ButterComp, a digital compressor effect plug-in for Mac. July 6, 2010 · Posted in Uncategorized · Comments Off on ButterComp, a digital compressor effect plug-in for Mac. Airwindows has released ButterComp, a digital compressor effect plug-in for Mac. Like Desk, rather than apply color to the sound, ButterComp does its thing by using a better algorithm, a peculiar approach to compression that hasn’t been done before to my knowledge. Some bits of it are inspired by remarks from Alexey Vaneev, and some bits of it are strange Airwindows things he knows nothing of the upshot is, this compressor produces virtually no high frequency hash, and sounds bloom out of it in a delicious way. ButterComp is available to purchase as an Audio Unit effect plug-in for Mac, priced at $59.99 USD. Kuassa has updated Amplifikation Lite to version 1.1.0 for Windows and released Mac OS X AU and VST versions of this free plug-in. Amplifikation Lite is a “lite” version of the forthcoming Kuassa Amplifikation Custom Tube Amplification Software for real-time guitar processing. 16tone’s Vogue Quattro is a free standalone four-voice synth for Intel Macs . It has microtonal capabilities and it comes with a library of 3,000+ tuning files. This is a standalone synth so you’ll need Cycling ’74 (free) Soundflower to re-route its output and be able to record it .